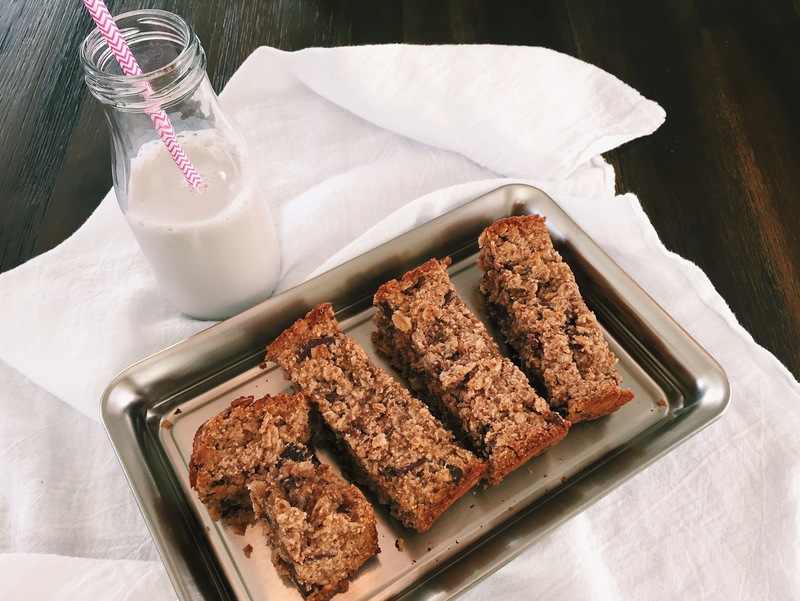 Almond Pulp Chocolate Chip Bars – A Healthy Pinch. As we have embarked on a few new house projects, painting our rooms have been the easiest to tackle first. Painting has really provided time for me to unwind while listenening to the podcasts that have been building up in my library. The most recent TED talk on the concept of originality really struck a chord. They pose the question: when is copying flattery, when is it thievery and when is it sheer genius? Just because we, as humans, tend to borrow, riff or sample ideas from others does not make us unoriginal- it actually makes us innovators. It’s a novel concept since we (I) have grown up with the belief that the inherent nature of using someone else’s work is morally wrong. Now, of course I believe stealing another recipe and passing it off as my own would be a breach of credibility but honestly, as a home cook, my inspiration comes from the countless blogs I peruse or the cupboard full of cookbooks I have accumulated. For the longest time, feeling unoriginal has been a mental block which has held me back from posting recipes or sharing my thoughts. I almost felt unworthy for sharing a recipe that I had not created completely from scratch. The food blog universe is vast and ever-expanding so the idea that I was posting a dish or recipe that’s been done plenty of times before was a bit daunting. I kept thinking, “what’s the point?” However, my feelings of inadequacy are slowing wearing off because I now realize that it doesn’t matter. Originality is a relative term. This space is mine and I enjoy sharing what comes out of my kitchen and hopefully there are a few people that do too. Now, enough about feelings and on to the recipe! If you make your own almond milk, this is a perfect solution to the issue of the remaining pulp. It is pretty much almond meal, just a bit more damp so I let it sit out overnight on a baking sheet to dry a little before baking with it (though it’s not necessary) Also, I love the cashew butter in these. It’s more mellow than almond butter, which I think is perfect. I’ve made these twice now and they come out moist and chewy and perfect. Give them a try! Preheat oven to 350° and line a loaf pan with parchment paper, making sure it hangs over the sides for easy removal later. In a medium-sized bowl, mix the maple syrup and flaxseed together with a fork making sure its fully combined. Let sit about 10 minutes until fully gelled. Be sure to do this step first as this will act as the egg in the mixture, binding everything together. In a large bowl, whisk together the almond pulp (or flour), oats, cinnamon and sea salt, breaking up any clumps. Stir in chocolate chips. Once the 10 minutes is up for the maple syrup mixture, stir in the cashew butter and vanilla until completely smooth. Pour this wet mixture over the dry mixture (almond pulp, oats, cinnamon & salt) and stir together until everything has been absorbed and the dough is sticky. Add the dough to the loaf pan and spread out evenly and flat with a rubber spatula. For dough using almond pulp, bake for 30-32 minutes until very golden brown and firm on top. I have not used almond flour yet, so I can’t speak to the results. Let the bars cool completely, at least an hour, before slicing as they are delicate and will fall apart. You can wrap them individually and store in the refrigerator for at least a week- if they last that long!